Bakeware (or Bake Ware) is something I love to use. Baking is a major reason I love to cook. 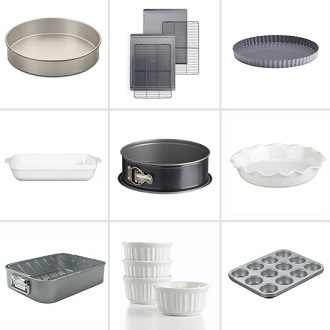 To do the job well, you need some good basic bake ware. There is a huge variety of materials, sizes and shapes available on today's market. As with cookware, the material used is probably the most confusing issue when deciding what you'd like to use for baking. The information on this page will help you decide what might work best for your needs. Different materials mean different effects on your baking and baked goods. For example, a bakeware pan with a dark surface will cause the food to brown more easily because it adsorbs the heat from the oven more readily. An aluminum pan conducts heat evenly but its shiny surface also reflects heat and may cause the food not to brown well. Some of the major materials' pluses and minuses are summarized here. Aluminum: A good material for conducting heat which results in even baking, unless the aluminum is "thin." Thinner aluminum bakeware is less expensive but may not last if exposed to high heat. Uneven baking will result. Heavy aluminum is durable and will not rust. Do not use aluminum bake ware with acidic foods. The aluminum and food will "interact." Tinned Steel: Steel coated with an internal layer of tin making it a good conductor of heat. It may darken after use which may affect baking times. Tinned steel is more difficult to maintain than some other materials. You should hand wash tinned pans and dry it thoroughly. Do not use scouring pads to clean it. Tinned steel rusts if not carefully maintained. Silver Anodized: Actually there is no silver in this type of material. The aluminum it is made of has gone through a process that hardens the outer layer making it scratch resistant and stick resistant. You must be careful not to scratch the surface. Using a knife with is material is a "no-no." Baking times may need to be reduced when using this material. Hard Anodized: Aluminum that is processed much longer than the silver anodized variety resulting in a much harder surface. Knives will damage the surface but most other metal tools will not. This material is darker than any of the above so baking times need to be checked frequently. Hand wash as with the silver anodized pans. Oven-Proof Glass: Very versatile and dishwasher safe. Food browns well when using glass baking pans. You can move this material from the refrigerator or freezer to a preheated oven or even a microwave. Because glass pans heat up fast and hold the heat longer, I always reduce my baking temperature by 25 degrees F when I use it. Stainless Steel: Strong and easy to clean but not a good heat conductor unless combined with copper or aluminum between layers of stainless steel. 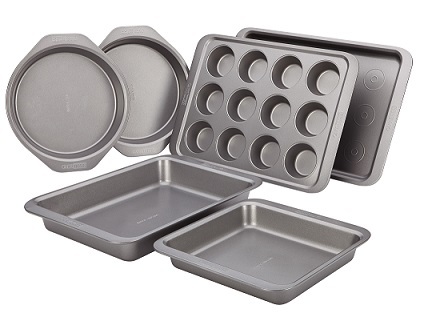 Stainless steel bake ware does not distribute heat evenly unless it has been combined (layered) with other material. Stoneware (not earthenware): Adsorbs the heat, distributes it evenly and retains the heat long after it is removed from the heat source. Buy this with a porcelain-enameled finish. It is incredibly durable; safe in the oven, microwave, refrigerator and dishwasher. Some stoneware needs to be seasoned before using although more and more stoneware is now available pre-seasoned. Cast Iron: The best for even heat. Some is "finished" with porcelain-enamel. Some cast iron is pre-seasoned. Downside: HEAVY. Silicone: Another material on the scene. It is used primarily for baking molds. It allows food to be easily removed from the pan. It is made of a flexible and bendable silicone material that is oven, microwave and freezer safe. Silicone does not actually absorb the heat but it allows the heat to transfer evenly to the food. The cooking process stops as soon as the food is removed from heat. It is dishwasher safe. Just click on any item in the table below and you'll find those recommendations, pictures and places to further your personal research. 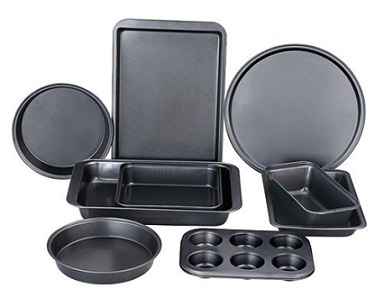 If you are interested in information about bake ware sets, rather than on individual pieces, click on that link.